More than any other episode in recent memory, “Damocles -Part 1" boasts an aura of death. I know that sounds like a strange claim to make about a show that just aired an episode that hinged on the fact that a whole lot of people were indulging in cannibalism to survive in a bunker where people are forced to fight to the death, but I think it rings true. 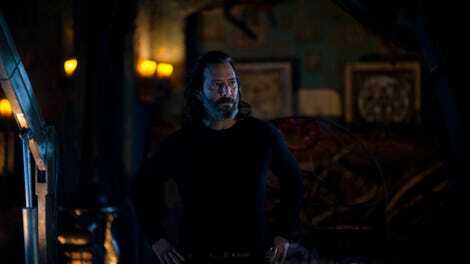 With Octavia marching into a situation we all knew she was unprepared for—she refused to heed Bellamy’s advice and listen to his knowledge about McReary knowing about their attack—it felt like anything could happen, that The 100 could sacrifice a major character at any moment in order to make an emotional impact. After all, what’s been lacking this year is true stakes and consequences. Every argument about how to proceed after Priamfaya, and how to approach the situation in Shallow Valley, has felt void of true consequences. The sense has been that all paths lead to war, and that means everything in the meantime is rather inconsequential. Now, plenty of the episodes this season have given us insightful character moments, so it wouldn’t be fair to call that inconsequential, but the overarching plot has been stagnating because it feels like we’ve just been waiting for the confrontation that “Damocles - Part 1" finally delivers. That confrontation is about as disastrous as expected. With McReary well aware of what’s about to happen, his army makes quick work of Wonkru. Kane, back at the McReary camp, listens to his people being slaughtered, the first heartbreaking moment in an episode filled with them. The bodies start to pile up immediately, and while death or the promise of death is a pretty simple storytelling tool to inject stakes, it certainly works here. You get the sense that anybody could die, and by the end of the episode a few lives are certainly hanging in the balance, including Kane’s, who faces one of the more gruesome attacks in the show’s five-season run. The question is, does “Damacles - Part One” earn its violent moments, or is it all rather exploitative? To me, there’s an integrity in the way the show has handled certainly storylines above others this season, and this episode, and presumably next week’s second part, is the payoff. This is an episode that embodies the best and worst qualities of the season. 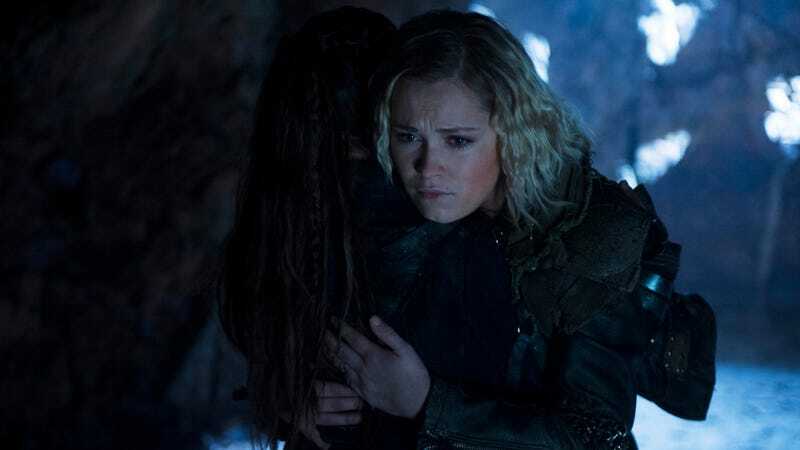 Clarke’s motivations have felt off since the first few episodes, and they’ve only grown stranger as the season’s progressed. Pulling a gun on Raven and showing a manic side of personality doesn’t just feel weird, it feels wrong. It’s an inner conflict that’s not fully explored, and that should be more emotionally devastating than it is. Her moments with Abby stand out as scenes that work on an emotional level, but that only makes everything else stick out like a sore thumb. Where The 100 and “Damocles - Part One” really succeeds though is in Octavia’s story. She’s been the villain of sorts this season, a complicated leader that’s used violence to get her way, but with a backstory that’s helped us understand why she made those decisions for her people. Last week’s episode felt like a too-late attempt to clarify some of her motivations, but it does help to add some depth to this week’s episode. Essentially, “Damocles - Part One” lets us know that this season is all about Octavia. Everything about the struggles of living through Praimfaya and how to survive and coexist after can be filtered through her. Perhaps I should have realized this earlier; perhaps the show should have done a better job of moving her arc front and center. Either way, this is an episode that digs into character psychology in a way that’s incredibly impactful, and it all begins when Octavia marches her people into battle knowing that things probably won’t turn out the way she hopes they will. And yet, she insists. She’s persistent in her need to march into battle and take Shallow Valley. That persistence is the sadness and tragedy at the heart of the episode. This isn’t Octavia being a valiant leader, it’s her being caught in a cycle of violence, unable to escape or see Bellamy’s extended hand as the help she needs. For five years she had to make choices nobody else would, and now she doesn’t know how to be the person she once was. The “Dark Year,” and the bunker in general, changed her. Now, with other options besides violence in front of her, she doesn’t know what to do. That struggle is the highlight of “Damacles - Part One,” and with any luck, it will carry through to next week’s finale. Clarke: “Love is weakness. Isn’t that what the Commanders in your head tell you?” Madi: “All but one.” Oh man, what a gut punch. I don’t like the road the show has taken to get to Clarke seeing straight, but that exchange with Madi nearly made up for all the sloppy storytelling. In other romance news, I’ve definitely come around on Raven and Shaw. Abby remains a very sad, very broken character.